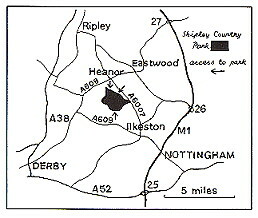 Shipley Country Park is a major asset for the County of Derbyshire and the surrounding areas. Indeed, it is a national asset. Its value is not spectacular, such as the Peaks, but as an example of a feudal park, as old as any in Britain, with many of the features of the evolution of such an estate essentially intact and with a documented history from 1000 AD to the present, it offers a unique insight into the history of these islands. The Shipley Estate, of which Shipley Country Park is the core (1/3 of the original land area), is unusual as having been the majority land-holding of a once powerful and wealthy family. Being a distinct and contiguous land area, the Country Park offers considerable scope for ecology and environmental studies. 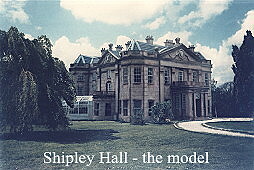 This site is a record and tribute to the Shipley Environmental Education and Interpretation Team (SEE IT), 1985-1987. During its two years of existence, the team produced an extremely wide range of printed interpretative publications and educational study materials; display Panels; multi-panel exhibition displays; a scale model of Shipley Hall and a relief map of the Country Park and audio-visual video films. Detailed environmental surveys and studies were made of all the major areas of the Country Park. From these, a number of specialist reports, habitat appraisals, management plans and schools activity materials were completed to form a major resource of study materials. A unique and very extensive collection of historical documents and maps was assembled, catalogued and, partially, summarised in research papers. A computer database of genealogical information was developed. Many photographic slides and prints, both contemporary and historical were assembled. Last but not least, two major reports were produced on facilities in the Country Park for disabled persons and for cyclists. Return to Home Page Comments to dr.brian.taylor@ntlworld.com href="/shipley/cover.htm"